Everything just works so well together with this! The lighting & softness is great! Beautiful image! radiant...it's as if from a fairy tale...strong work! Gorgeous, just gorgeous. If I had the money, I would fill up my home with your images so I could always be surrounded by beauty and inspiration. You do the best bugs - especially butterflies! Man, this is good! The light always kills me and your focus is dead one target. Great job. Almost fairy like. Beautiful warm soft tones. Wonderful lighting and colours! This will make a beautiful print. I'm not a huge fan of the white border but the shot is great. 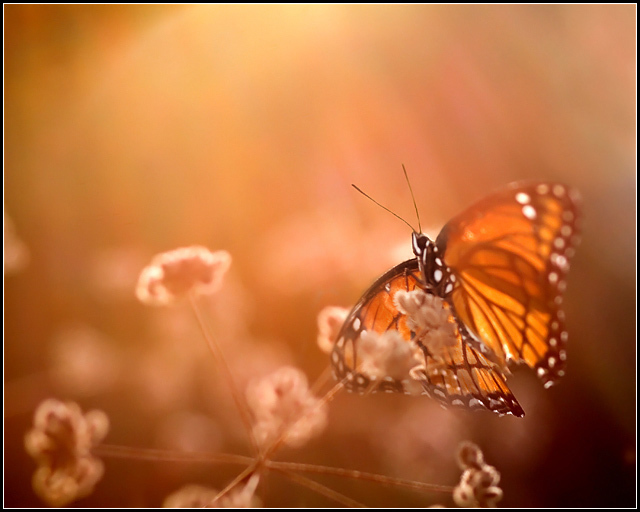 Lovely, warm tones to compliment the colors of the butterfly. Proudly hosted by Sargasso Networks. Current Server Time: 04/20/2019 04:20:07 PM EDT.